This paper presents a new and effective method to achieve fast machining simulation via the frame-sliced voxel representation (FSV-rep) workpiece modeling environment. The FSV-rep workpiece modeling scheme has been demonstrated as an efficient and accurate geometric modeling format for simulating general milling operations. The method presented in this paper specifically targets linear tool paths in three-axis milling. Based on the boundary representation of the linear tool swept volume and the voxel space for modeling the workpiece, it partitions the swept volume into a set of elemental regions, named as the swept volume regions (SVRs). With SVRs, the best performance of FSV-rep workpiece model update in three-axis milling is achieved. 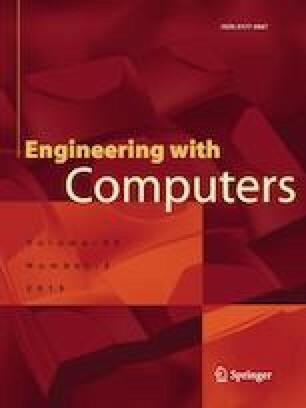 In the representative case studies, up to an order of magnitude faster computational performance has been observed compared to the generic approach of approximating the tool swept volume as a set of sampled tool instances. In addition, the quality of the simulated machined surface is much improved due to the use of non-approximated tool swept volumes. The efficient way to use SVRs in FSV-rep workpiece model update and the specific qualities of SVRs enabling the observed superior performance are also discussed in the paper. This research has been funded by the Natural Sciences and Engineering Research Council of Canada (NSERC) under the CANRIMT Strategic Network Grant as well as the Discovery Grant.